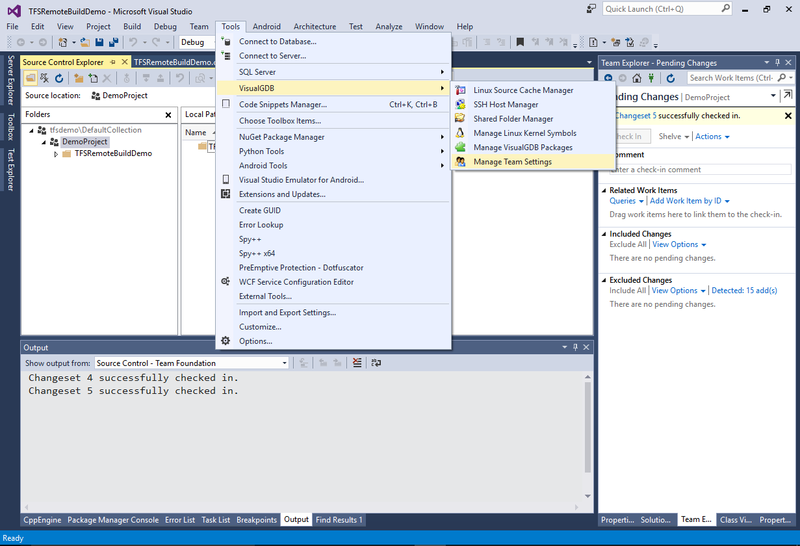 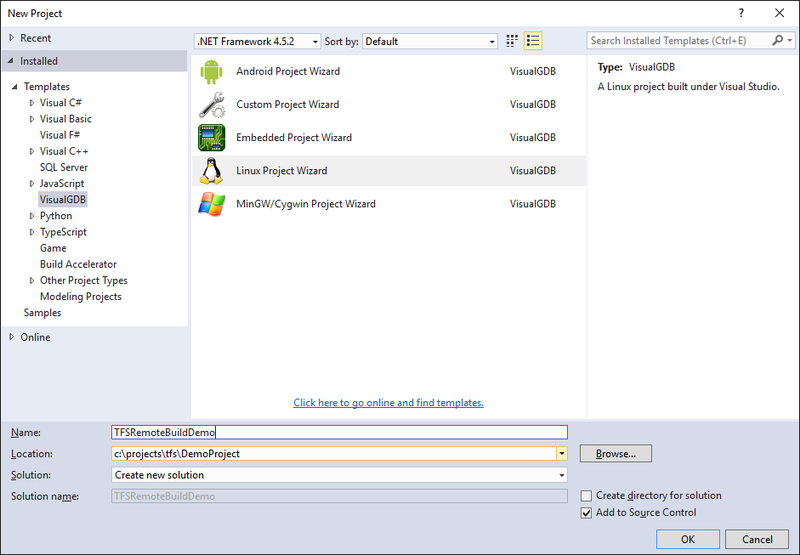 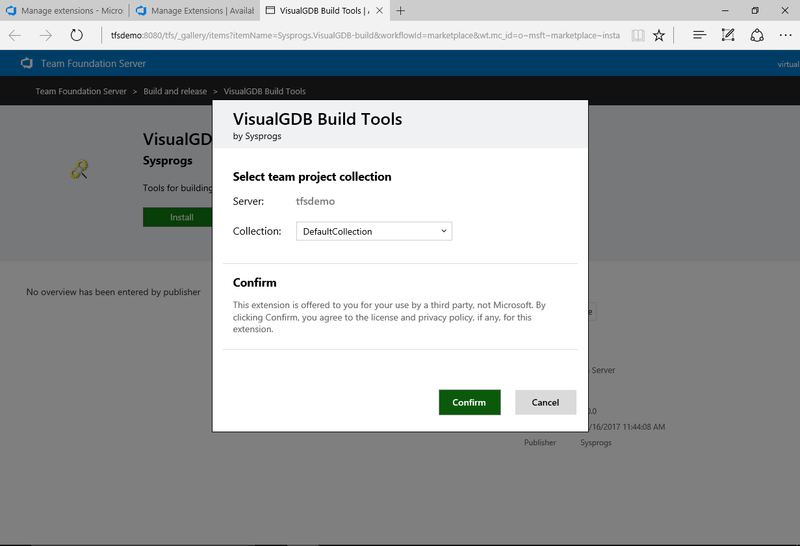 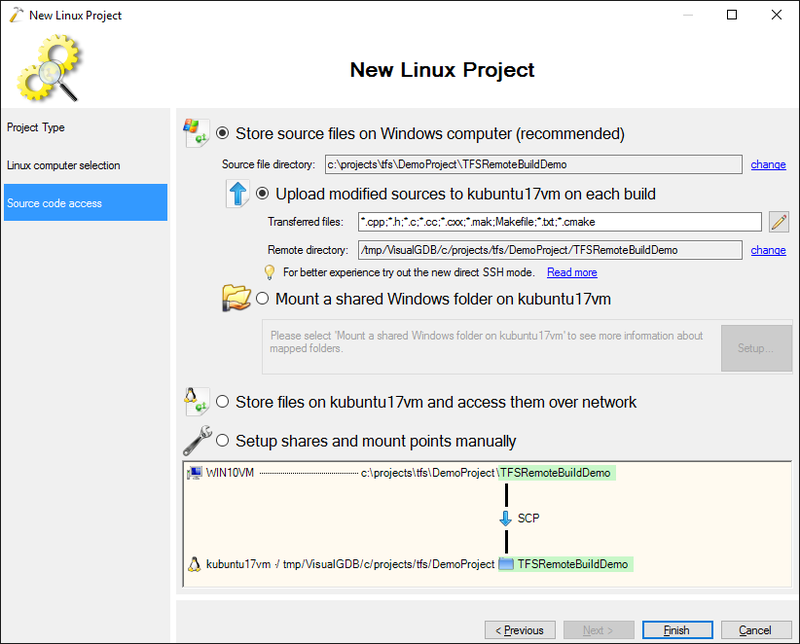 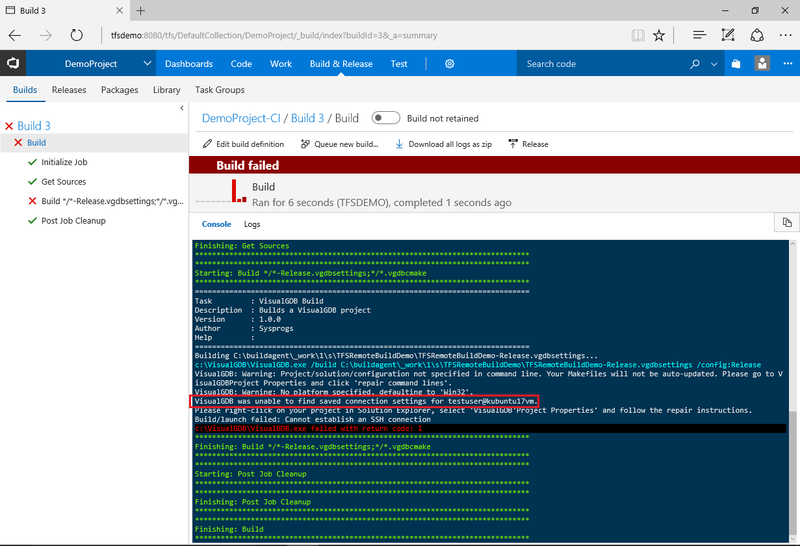 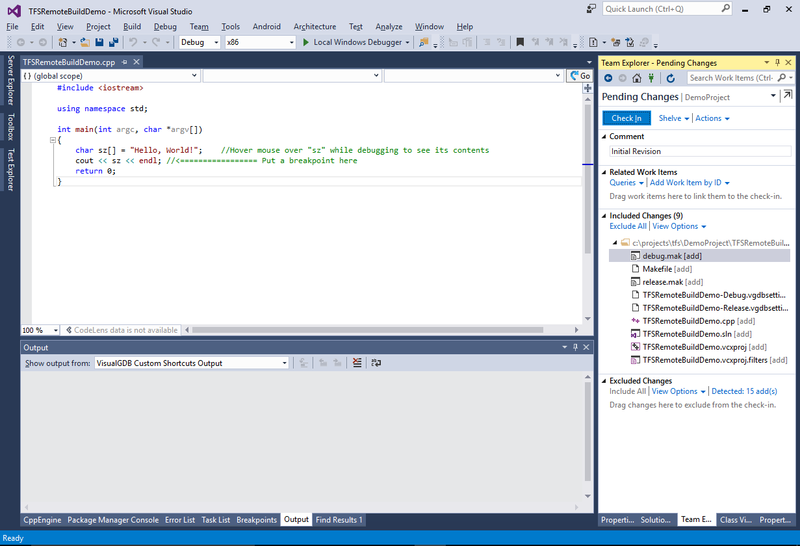 This tutorial shows how to build non-MSBuild VisualGDB projects using Team Foundation Server. 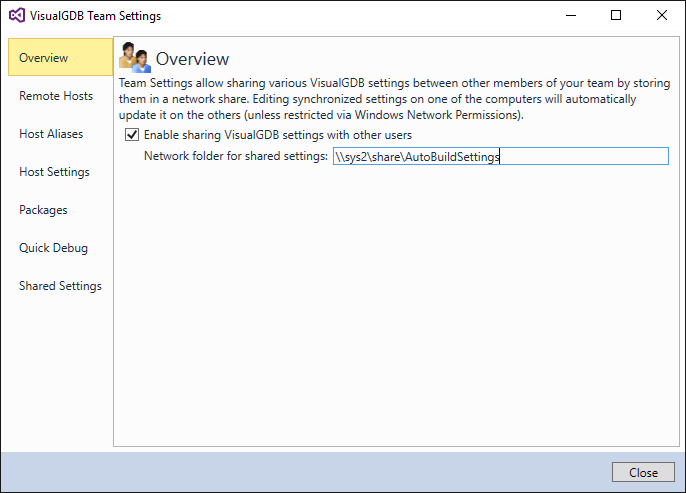 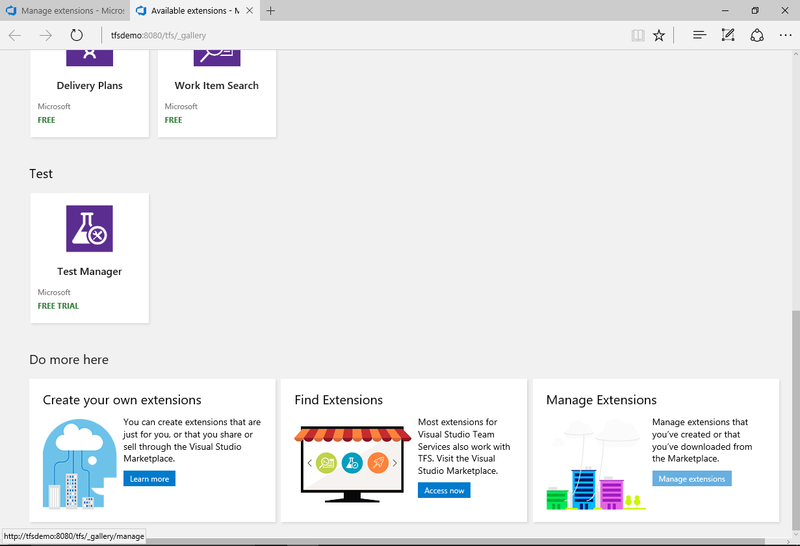 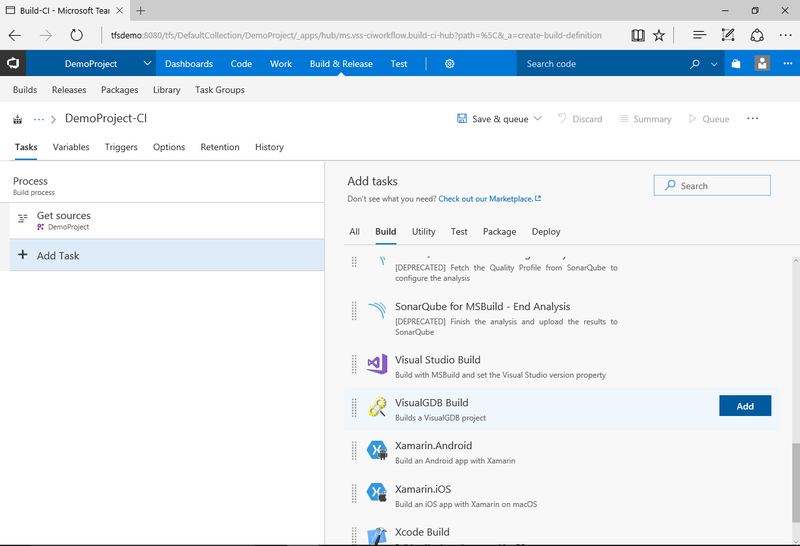 In this mode you don’t need a separate Visual Studio installation on your build server (although you still need a separate license of VisualGDB if you want to make use of the VisualGDB logic for uploading sources, synchronizing settings and running custom actions). 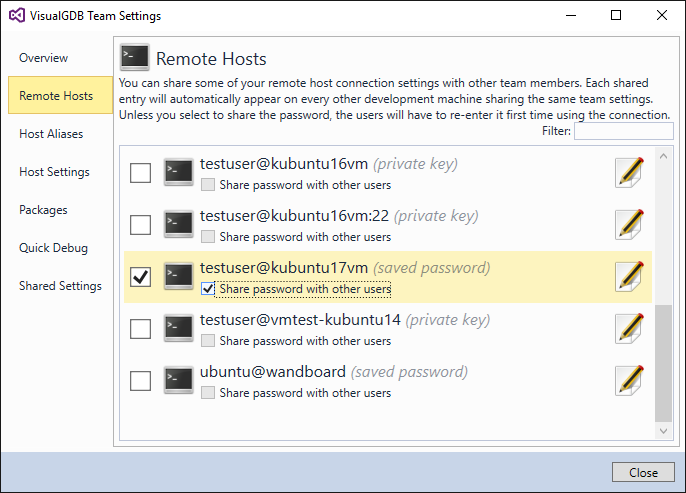 If you haven’t configured TFS yet, we recommend following our basic TFS integration tutorial first. 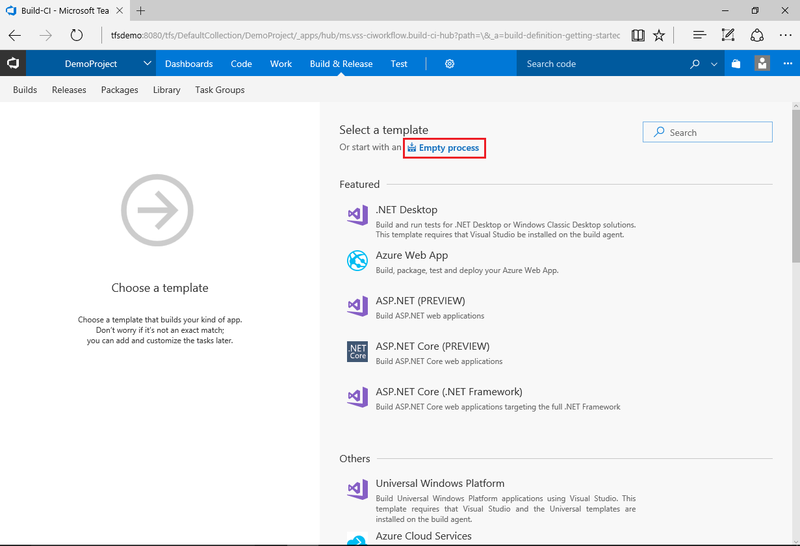 In this tutorial we will use 2 machines: server that will run the TFS build agent and client that will be used for editing the projects in Visual Studio. 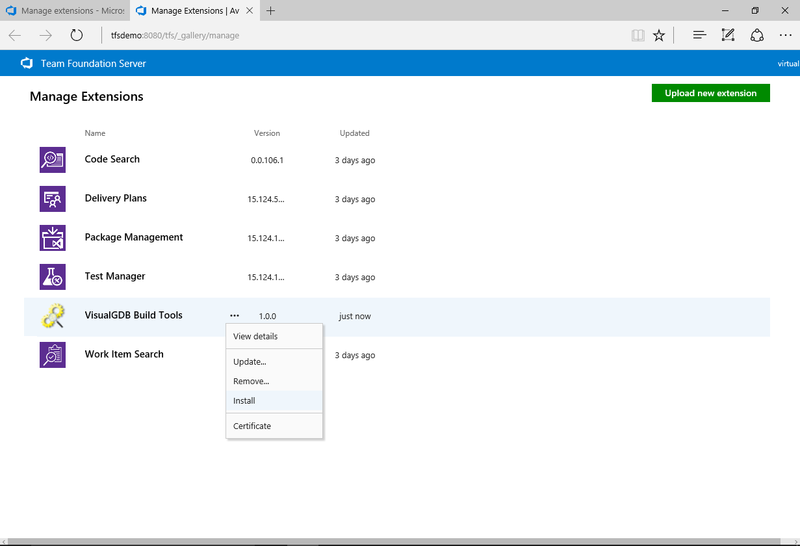 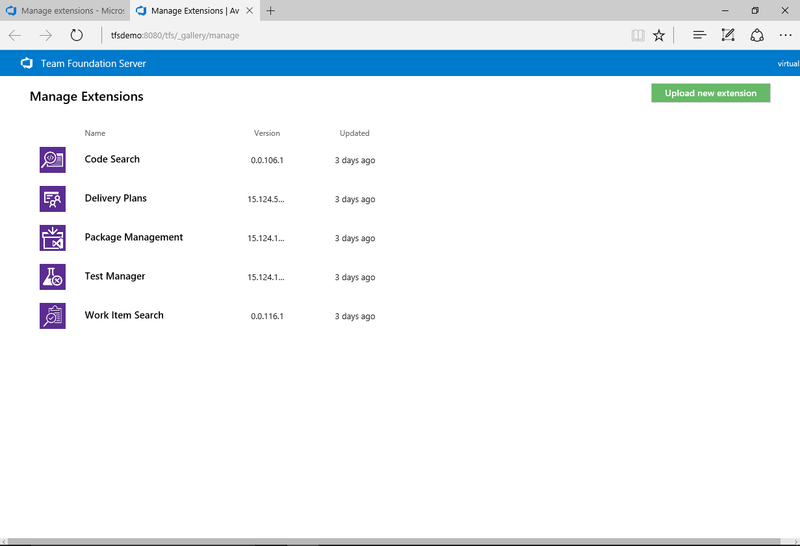 Install TFS on the server and configure the build agent. 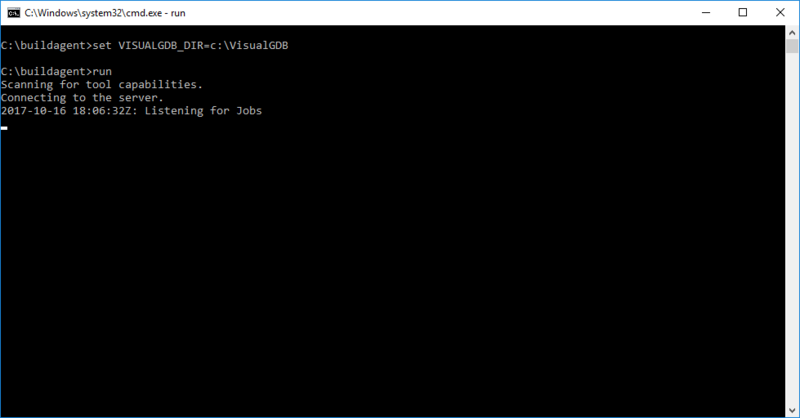 Copy the contents of the C:\Program Files (x86)\Sysprogs\VisualGDB folder on the client to an arbitrary location on the server. 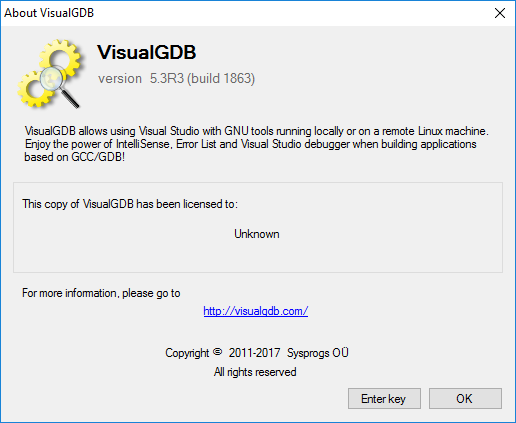 Then run VisualGDB.exe /about to enter your license details or VisualGDB.exe /intro to start a trial on the build server: Note that using VisualGDB with TFS requires version 5.3R3 or later. 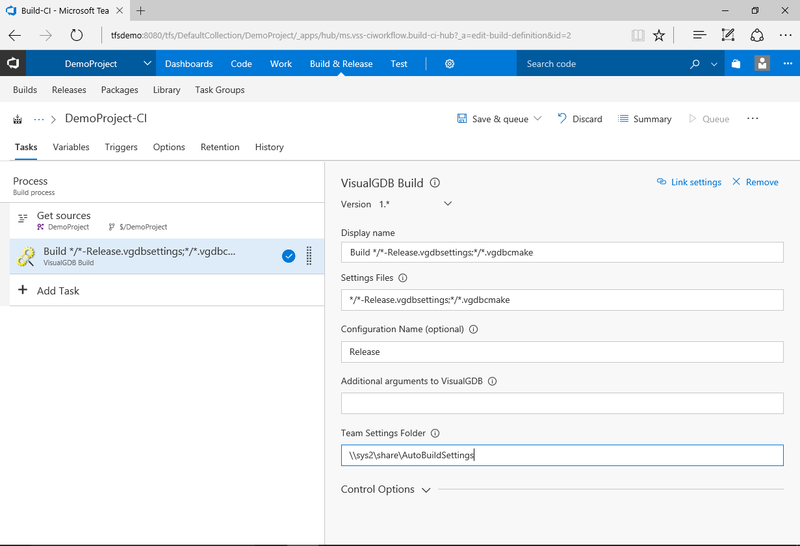 Set the VISUALGDB_DIR environment variable to point to the VisualGDB directory and run the build agent on the server: If you are running the build agent as a service, ensure that the VISUALGDB_DIR variable is set globally on the machine where the agent runs. 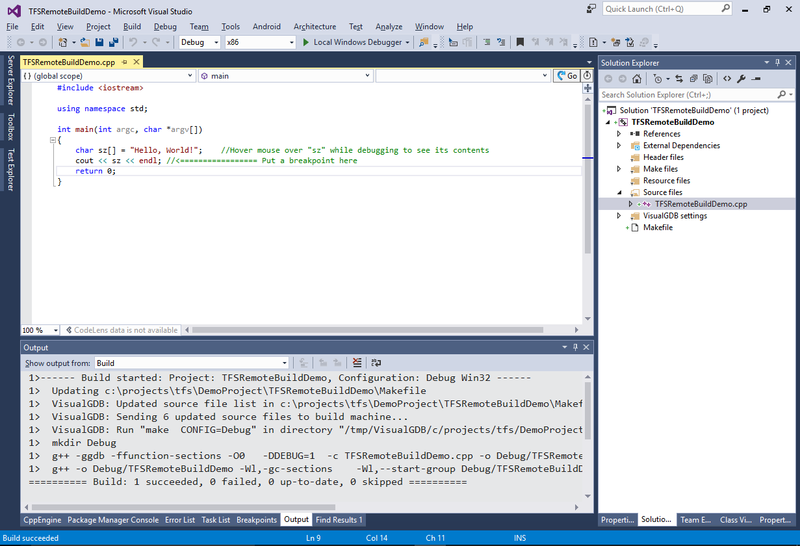 On the client begin creating a new VisualGDB project inside your TFS checkout directory (see this tutorial for details on setting up a TFS project and creating a local checkout): The techniques shown in this tutorial will work for different project types, however we will use a basic Linux project do demonstrate it. 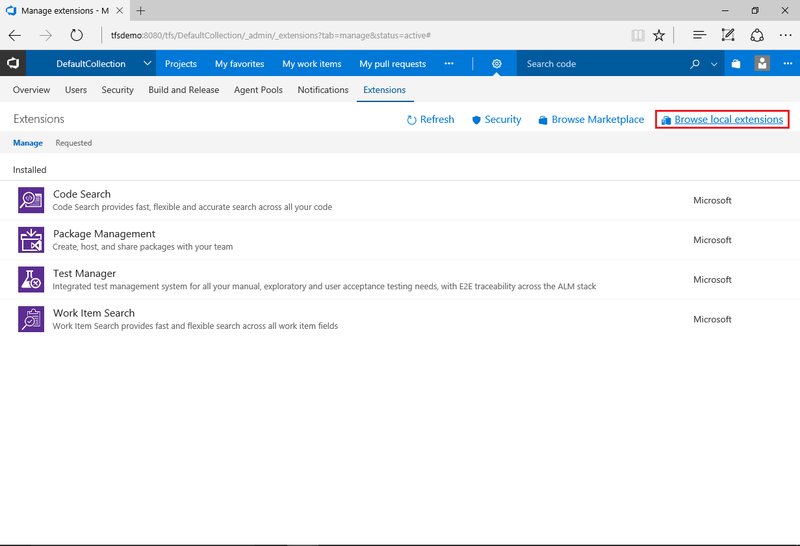 Proceed with the default settings for uploading source files: If you want to avoid multiple users uploading source files to the same directory, you can use the $(USERNAME) macro in the ‘remote directory’ field. 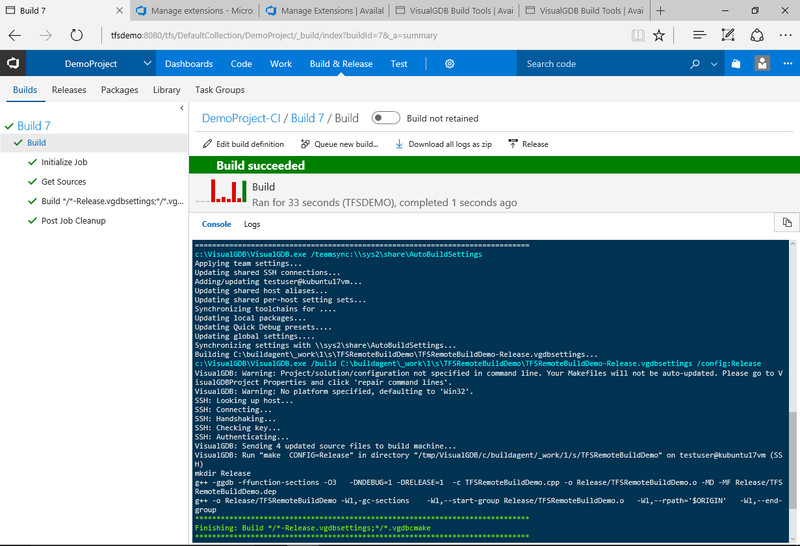 In the VisualGDB build settings select the files inside your TFS project that should be built. 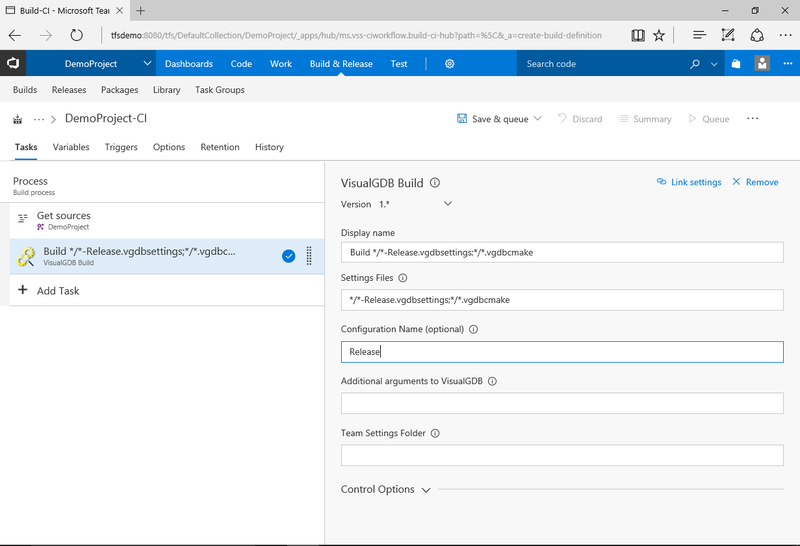 VisualGDB stores its configuration in the .vgdbsettings files for most of the projects (one file per configuration) and in the .vgdbcmake files for projects using the Advanced CMake Project Subsystem (one file per project). 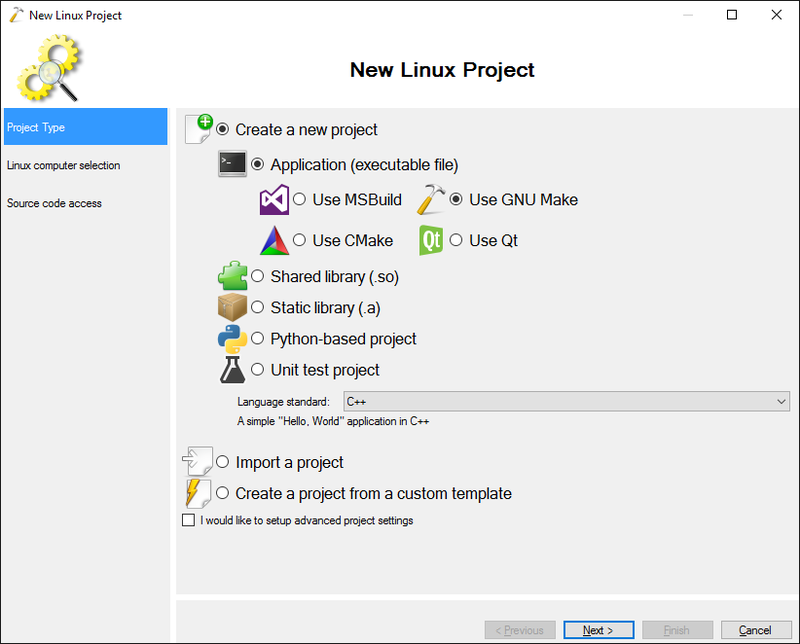 The default settings will build all CMake projects and the release configurations of the non-CMake projects: If you have any .vgdbcmake projects in your repository, set Configuration Name to “Release”. 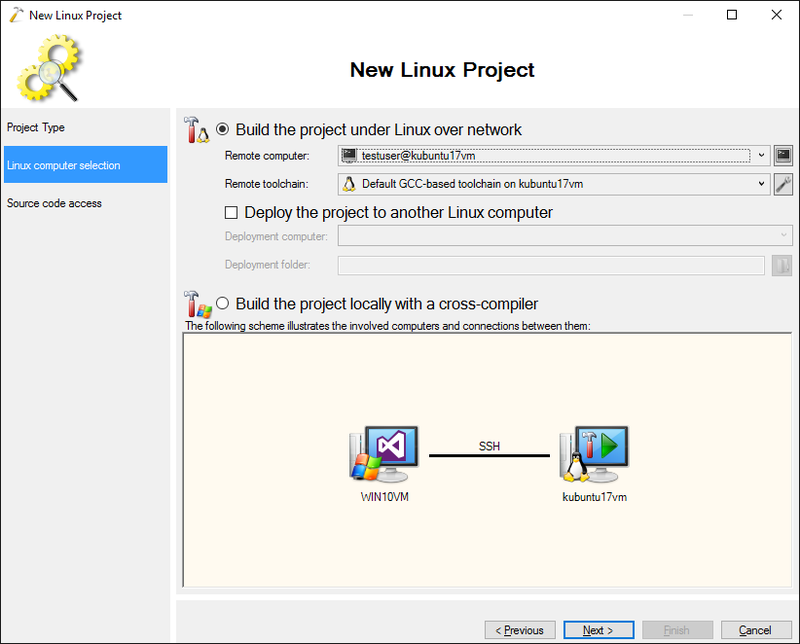 Now you can simply queue the build again and it will succeed: Each time you use a new Linux machine (or a different toolchain), simply share it via the Team Settings window and VisualGDB will automatically configure it on the build machine without any further manual setup.